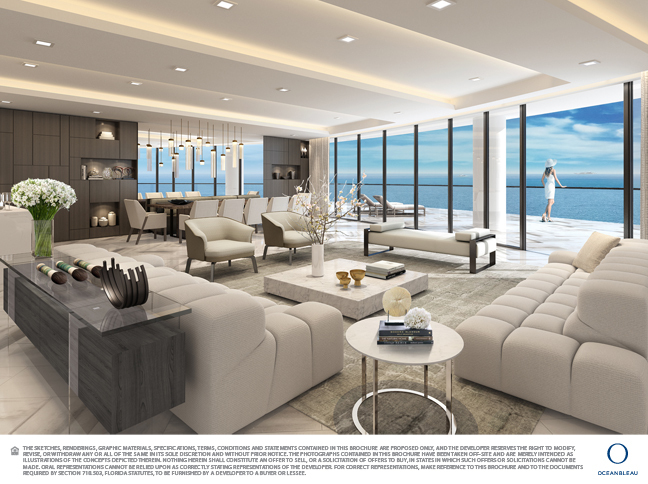 All residences feature both ocean and Intracoastal views. Palatial 3, 4 and 5 bedroom floor plan sizes of 3,000 Sq. Ft. and 6,000 Sq. Ft. Expansive outdoor living spaces of more than 1,100 Sq. Ft. with 10-foot depths. • Floor-to-ceiling glass throughout. 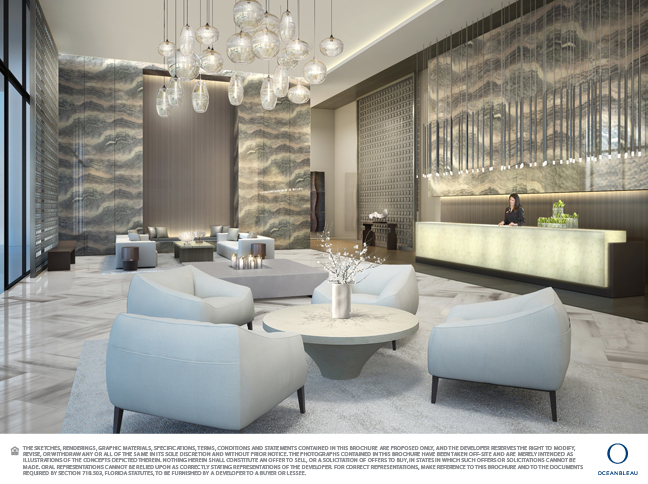 10-foot ceiling heights, Penthouses with 12-foot heights. All residences feature private elevators. 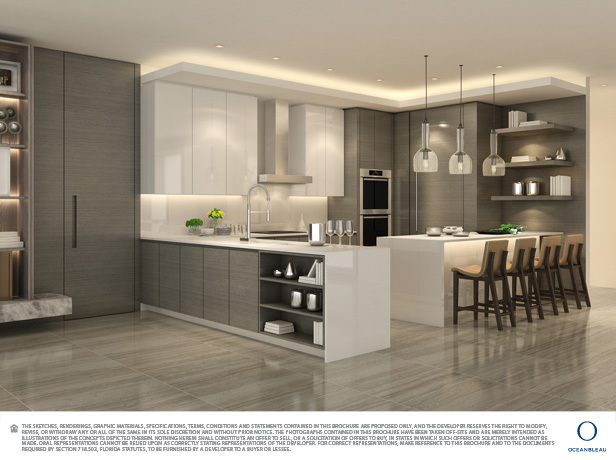 Custom European Kitchens featuring chef island, integrated seating, spacious storage and concealed cabinetry. Top-of-the-line appliances by Sub Zero, Miele and Wolf with concealed dishwasher, wine storage and stainless steel under-mount sink. Master Suite with separate sleeping and lounging areas. European-design master bath featuring separate spa tub and shower, with designer fixtures and accessories by Grohe and other top-of-the-line brands. Most residences feature separate his and her master bathrooms. Beach Service complete with lounges, towels and umbrellas. 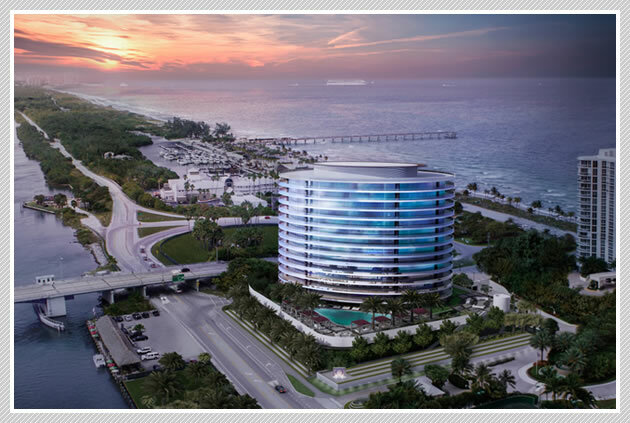 Serviced sunrise and sunset pools overlooking the ocean and Intracoastal. • Open-air poolside cabanas. Poolside cabanas available for purchase, complete with living area, kitchenette and full bathroom with shower. Lavishly landscaped entrance, adorned with modern water features and ornate greenery. Several water-front dining options steps away. State-of-the-art fitness center, complete with separate aerobics studio. Resort-style spa featuring men’s and women’s wet areas, dry and wet steam, massage room. • Social room with audio/visual entertainment technologies, bar and wine feature, and kitchen for private events. Outdoor garden boasting BBQ and dining accommodations. • Latest high-speed elevators. Private storage area for bicycles and water activity boards. • 24-hour front desk attendant. Relaxation decks surround the wellness perimeter. Marina in walking distance from Oceanbleau.